December 2015 – DEWright Inc.
Net imports accounted for 26.5% of total petroleum and other liquid fuels consumed in the United States in 2014, the lowest percentage since 1971. Data through the first nine months of 2015 indicate a further reduction of net imports, averaging 24.6% of total consumption of petroleum and other liquid fuels. Increased U.S. crude oil production has replaced some crude oil imports, while increased refinery runs and global demand growth for petroleum products resulted in increased U.S. petroleum product exports. As a result, the United States remains a net importer of crude oil but less so, and is increasingly a net exporter of petroleum products. However, the extent to which regions of the country contribute to these changing trends varies. U.S. net imports of total petroleum and other liquid fuels have declined by 7.5 million barrels per day (b/d) since 2005 to 5.1 million b/d in 2014. 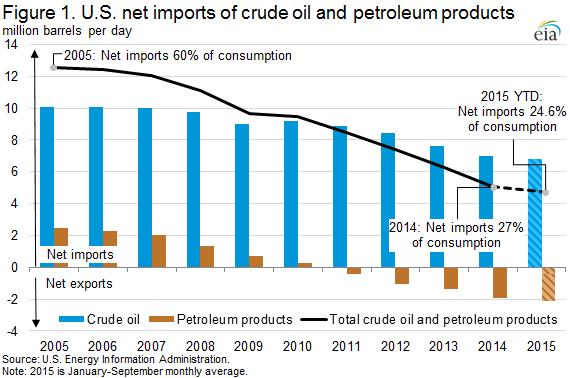 U.S. net imports of crude oil declined 3.1 million b/d between 2005 and 2014, with a further 0.2 million b/d decline for the first 9 months of 2015. The change in petroleum net imports other than crude has been even larger, with a 4.4 million b/d reduction in net imports between 2005 and 2014 (Figure 1). Crude oil supply patterns vary by region–some rely on imported crude oil, others mostly on domestic crude oil supply. Refineries on the East and Gulf Coasts (Petroleum Administration for Defense Districts (PADD) 1 and 3, respectively) have reduced their dependence on imported crude inputs in recent years. With very little crude oil produced in the region, refineries in PADD 1 historically imported close to 100% of the crude oil processed in the region. As crude-by-rail transport allowed increased shipments of domestic crude oil from other regions to reach East Coast refineries, imports as a percentage of refinery crude inputs fell to 60% in 2014. Data through September indicate continued declines in imports as a percentage of refinery runs to an average of 57% so far this year, but declining at a much slower rate than in 2013 and 2014 as the price difference between domestic crude oil and imported crude oil has narrowed. The Gulf Coast region is home to more than half of U.S. refining capacity, and produces the most crude oil. From 2005 to 2010, PADD 3 crude imports as a percentage of refinery crude inputs ranged from 80% to 72%. However, as domestic crude oil production increased, that percentage dropped to 41% in 2014, and has averaged 37% through September of this year. 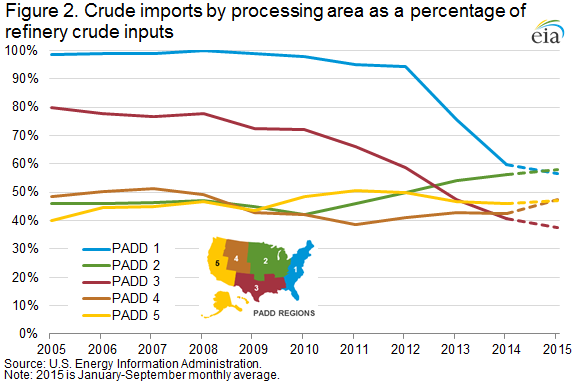 In contrast, refineries in the Midwest (PADD 2) and the Rocky Mountains (PADD 4) have increased imports, almost entirely from Canada, as a percentage of in-region refinery crude inputs to 56% and 43%, respectively, in 2014. Data thus far in 2015 indicate that the Midwest crude imports as a percentage of refinery crude inputs may exceed the East Coast for the first time, with the Midwest averaging 58% versus the East Coast’s average of 57% (Figure 2). Turning from crude to products, increased domestic crude oil production leading to discounted domestic crude prices, coupled with global demand growth for petroleum products, has resulted in continued high U.S. refinery runs and increased U.S. petroleum product exports. 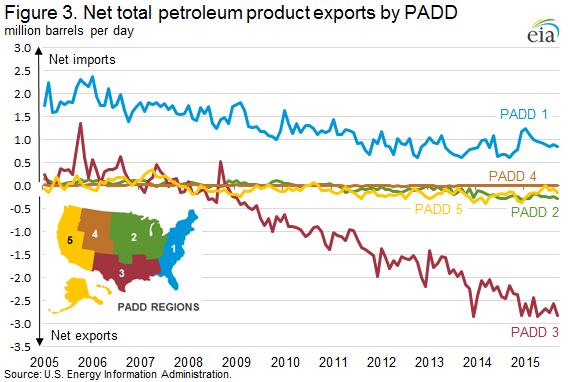 U.S. petroleum product exports have increased for 13 consecutive years, with growth in recent years coming largely from distillate and gasoline exports, and more recently with the expansion of Hydrocarbon Gas Liquids (HGL) export capacity. There is significant regional variation in petroleum product trade. Most petroleum product exports are from the Gulf Coast. Average PADD 3 total net petroleum product exports were 2.7 million b/d for the first nine months of 2015, in contrast to the same period of 2005 when PADD 3 was a net petroleum product importer of 280,000 b/d. Other regions have experienced far less of a dramatic shift in net import position. Average PADD 1 net imports in the first nine months of 2015 have fallen 913,000 b/d compared to the same period in 2005, helping the U.S. become a net product exporter. Data for the first nine months of 2015, which do not reflect the expected seasonal peak in gasoline exports during the final 3 months of the year, suggest that full-year 2015 U.S. net petroleum product exports will be higher than in 2014 (Figure 3). The U.S. average retail price for regular gasoline decreased two cents from the previous week to $2.04 per gallon as of December 14, 2015, 52 cents per gallon less than the same time last year. Prices decreased in all regions except the Midwest, where the price increased one cent to $1.90 per gallon. The East and Gulf Coast prices both fell three cents, to $2.04 per gallon and $1.79 per gallon, respectively. The Rocky Mountain and West Coast prices both decreased two cents, to $2.00 per gallon and $2.51 per gallon, respectively. The U.S. average price of diesel fuel decreased four cents from last week to $2.34 per gallon, $1.08 per gallon lower than the same time last year. Prices declined in all regions of the nation, with both the Midwest and West Coast prices decreasing five cents, to $2.29 per gallon and $2.55 per gallon, respectively. The East Coast price was $2.37 per gallon and the Rocky Mountain price was $2.38 per gallon, both four cents lower than last week. The Gulf Coast price was $2.21 per gallon, two cents less than last week. U.S. propane stocks decreased by 1.7 million barrels last week to 99.0 million barrels as of December 11, 2015, 20.6 million barrels (26.3%) higher than a year ago. Midwest inventories decreased by 0.7 million barrels while Gulf Coast and East Coast inventories both decreased by 0.4 million barrels. 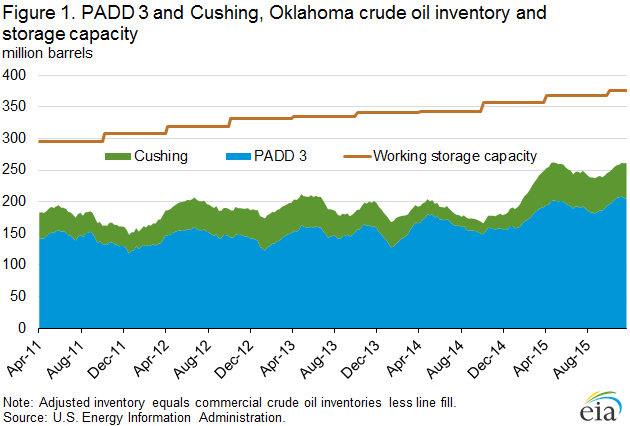 Rocky Mountain/West Coast inventories decreased by 0.2 million barrels. Propylene non-fuel-use inventories represented 3.2% of total propane inventories. As of December 14, 2015, residential heating oil prices averaged nearly $2.26 per gallon, almost 8 cents per gallon lower than last week and nearly an 89 cent decrease from one year ago. The average wholesale heating oil price this week is $1.17 per gallon, nearly 18 cents lower than last week and just below 99 cents per gallon lower than a year ago. Residential propane prices averaged $1.98 per gallon, 1 cent per gallon higher than last week’s price and 40 cents lower than one year ago. Wholesale propane prices averaged 46 cents per gallon, almost 4 cents per gallon lower than last week and 21 cents lower than last year’s price for the same week. 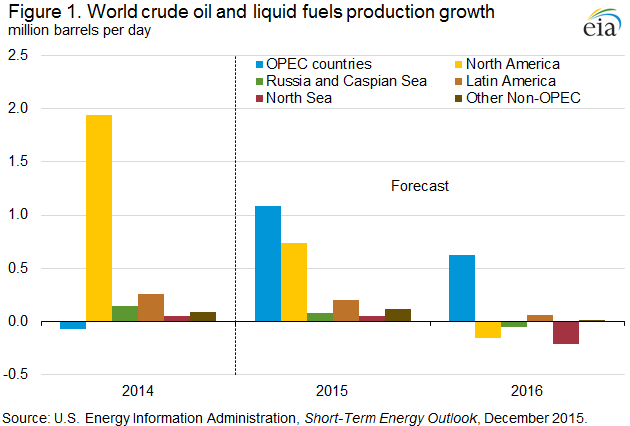 The Short-Term Energy Outlook (STEO) released on December 8 forecasts non-OPEC crude oil and other liquids production to grow by 1.2 million barrels per day (b/d) in 2015, and then decline by 0.4 million b/d in 2016, which would be the first annual decline in non-OPEC production since 2008. The shift in expectation from non-OPEC production growth to declines in 2016 is mostly because of declines in U.S. onshore and North Sea production (Figure 1). Non-OPEC production growth in 2015 is largely attributable to investments committed to projects before the oil price decline that began in mid-2014. Redirection of investment away from exploration towards currently producing fields has also helped maintain or increase production levels in other non-OPEC countries. This strategy has helped maintain production levels in the short term, but it will likely result in lower future production in areas that depend on continued exploration successes for output growth. According to the latest survey-based reporting of monthly crude oil production estimates, U.S. production averaged 9.4 million b/d through the first nine months of 2015. This level is 0.1 million b/d higher than the average production during the fourth quarter of 2014, despite a more than 60% decline in the total U.S. oil-directed rig count since October 2014. However, monthly crude oil production started to decrease in the second quarter of 2015. Lower 48 onshore output began declining in April 2015, and has fallen from 7.6 million b/d in March to an estimated 7.1 million b/d in November. Total U.S. crude oil production began declining in May 2015, and has fallen from 9.6 million b/d in April to an estimated 9.2 million b/d in November. EIA expects U.S. crude oil production declines to continue through September 2016, when total production is forecast to average 8.5 million b/d. This level of production would be 1.1 million b/d less than the 2015 peak reached in April. Forecast production begins increasing in late 2016, returning to an average of 8.7 million b/d in the fourth quarter. Expected crude oil production declines through September 2016 are largely attributable to unattractive economic returns in some areas of both emerging and mature onshore oil production regions, as well as seasonal factors such as anticipated hurricane-related production disruptions in the Gulf of Mexico. Reductions in 2015 cash flows and capital expenditures have prompted companies to defer or redirect investment away from marginal exploration and research drilling to focus on core areas of major tight oil plays. EIA forecasts OPEC crude oil and other liquids production to increase by 1.1 million b/d in 2015, led by production increases in Iraq. Forecast OPEC crude oil and other liquids production increases by 0.6 million b/d in 2016, with Iran expected to increase production once international sanctions targeting its oil sector are suspended. At its December 4 meeting, OPEC members announced they “should continue to closely monitor developments in the coming months.” This indicates OPEC producers, led by Saudi Arabia, are continuing the policy of defending market share in a low oil price environment. 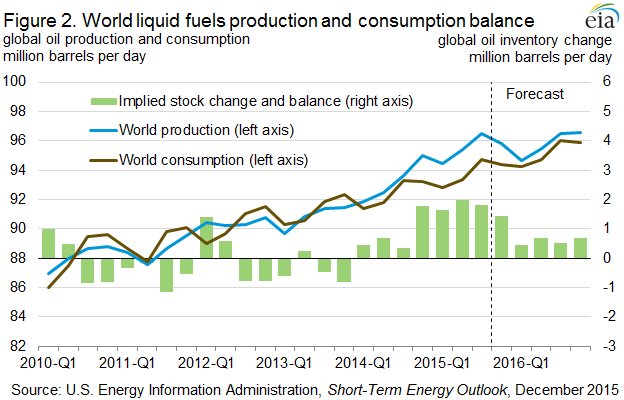 EIA expects global consumption of petroleum and other liquids to grow by 1.4 million b/d in both 2015 and 2016. Projected real gross domestic product (GDP) for the world weighted by oil consumption, which increased by 2.7% in 2014, is expected to rise by 2.3% in 2015 and by 2.6% in 2016. Despite continuing demand growth and slowing supply growth, global petroleum and other liquids production continues to outpace consumption, leading to inventory expansion throughout the forecast period (Figure 2). Global oil inventory builds in the third quarter of 2015 averaged 1.8 million b/d, down from 2.0 million b/d in the second quarter, which had the highest level of inventory builds since the fourth quarter of 2008. The pace of inventory builds is expected to slow in the fourth quarter to roughly 1.4 million b/d. In 2016, inventory builds are expected to slow further to an average of 0.6 million b/d. The current average price forecast for Brent crude oil in 2016 is associated with a further reduction in the outlook for supply growth that in turn reduces the surplus of supply over consumption. 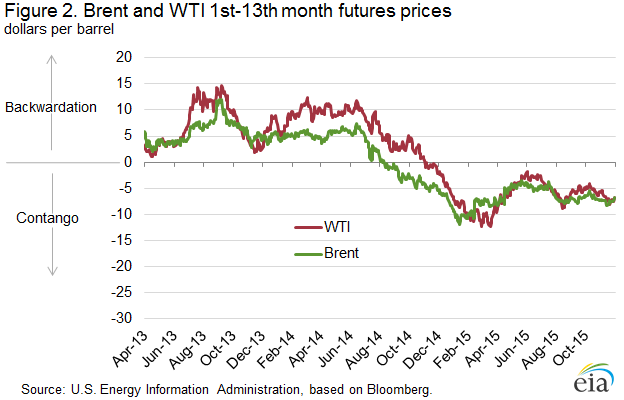 EIA estimates average North Sea Brent crude oil prices of $53/barrel (b) in 2015 and $56/b in 2016. The 2015 price forecast is $1/b lower than in last month’s forecast and the 2016 estimate is unchanged. Forecast West Texas Intermediate (WTI) crude oil prices average $4/b lower than the Brent price in 2015 and $5/b lower in 2016. Current values of futures and options contracts continue to suggest high uncertainty in the price outlook (Market Prices and Uncertainty Report). 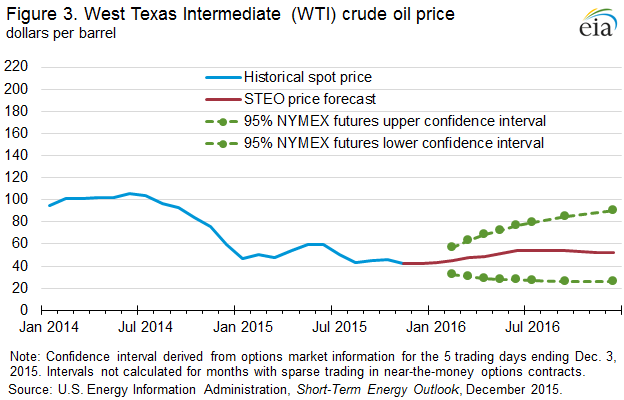 Based on contracts traded during the five-day period ending December 3, the lower and upper limits of the 95% confidence interval for the market’s expectation of monthly average WTI prices are estimated at $30/b and $63/b for March 2016, widening to $26/b and $90/b for December 2016 (Figure 3). Key market uncertainties include the pace and volume at which Iranian oil reenters the market, the strength of oil consumption growth, and the responsiveness of non-OPEC production to low oil prices. The U.S. average retail price for regular gasoline decreased one cent from the previous week to $2.05 per gallon as of December 7, 2015, 63 cents per gallon less than the same time last year. Prices decreased in all regions except the Midwest, where the price increased one cent to $1.89 per gallon. The Rocky Mountain price fell four cents to $2.01 per gallon. Both the East Coast and West Coast prices dropped more than one cent, to $2.07 per gallon and $2.54 per gallon, respectively. The Gulf Coast price was $1.82 per gallon, declining less than one cent from last week. The U.S. average price of diesel fuel decreased four cents from last week to $2.38 per gallon, $1.16 per gallon lower than the same time last year. Prices declined in all regions, with the largest decrease occurring in the Midwest, where the price dropped six cents to $2.35 per gallon. The East Coast and Rocky Mountain prices both decreased four cents, to $2.41 per gallon in each region. The Gulf Coast and West Coast prices both fell two cents, to $2.23 per gallon and $2.60 per gallon, respectively. U.S. propane stocks decreased by 3.4 million barrels last week to 100.7 million barrels as of December 4, 2015, 21.5 million barrels (27.2%) higher than a year ago. 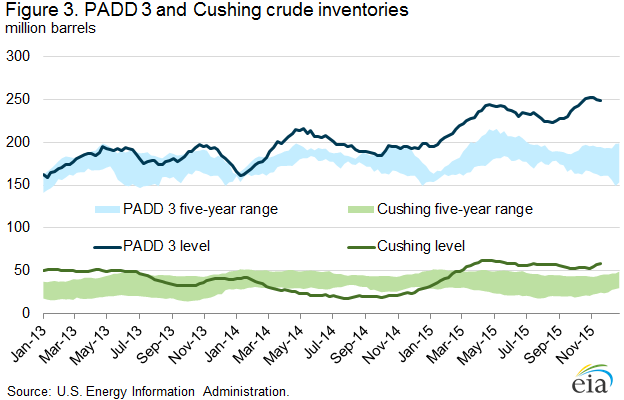 Gulf Coast inventories decreased by 2.4 million barrels and Midwest inventories decreased by 0.7 million barrels. East Coast inventories decreased by 0.3 million barrels while Rocky Mountain/West Coast inventories remained unchanged. Propylene non-fuel-use inventories represented 2.9% of total propane inventories. As of December 7, 2015, residential heating oil prices averaged $2.33 per gallon, 3 cents per gallon below last week and 89 cents lower than one year ago. The average wholesale heating oil price this week is $1.35 per gallon, nearly 8 cents lower than last week and 91 cents per gallon lower than a year ago. Residential propane prices averaged just under $1.97 per gallon, almost 1 cent per gallon higher than last week’s price and nearly 42 cents lower than one year ago. Wholesale propane prices averaged just shy of 50 cents per gallon, almost 1 cent per gallon lower than last week and nearly 25 cents lower than last year’s price for the same week.